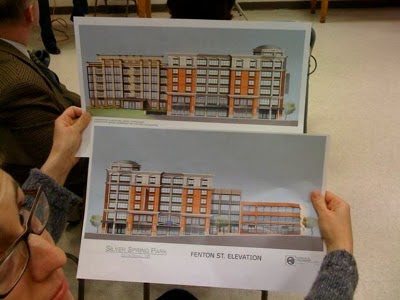 Last night, Eric from Thayer Avenue once again live-tweeted the proceedings at East Silver Spring Civic Association's monthly meeting, at which local landowner Ulysses Glee discussed his plans for a mixed-use complex he'd like to build on the parking lot at Fenton Street and Silver Spring Avenue in Fenton Village. Those who don't nearby may know the lot as the site of Fenton Street Market, intended keep the seat warm until ground is broken later this next spring. Photos of the proposal courtesy of Thayer Avenue. Glee has talked about building on this site for a few years now, and his latest proposal - renamed Silver Spring Park after the surrounding neighborhood's historical name - looks pretty good. It'll also help contribute to the appearance and vitality of Fenton Village, which Planning Department staff wrote about just today on their Straight Line blog. The design could use a little tweaking, however, to relate better to the neighborhood and its future tenants. Until last summer, the development was known as the Moda Vista, a condominium with retail on the first floor and a swanky modern façade the likes of which we haven't seen much of in Silver Spring. Downtown has quite a few modern buildings, but very few good ones. A 2007 rendering of the Moda Vista. Image courtesy of DC Metrocentric. 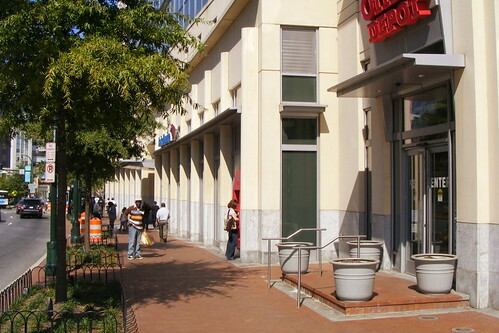 The Moda Vista promised to activate busy Fenton Street's sidewalks with storefronts, while on Silver Spring Avenue, it stepped back to line up with the yards of adjacent houses and provide residents a little green space. It was a clever, versatile design, and one I looked forward to seeing. Now, the program is much larger than before: fifty-eight apartments, seven of which would be subsidized by the County; 9,200 square feet of retail along Fenton Street; 22,000 square feet of office space; and a 110-room Fairfield Marriott hotel. This is a good thing, especially in a location just blocks from a major transit center, but it's now more difficult to make everything work together and with the neighborhood context. All we have is a cell-phone photo of a printed flyer from the meeting, but you can begin to see what the complex's exterior will look like. There are now two buildings instead of one - the apartments are along Silver Spring Avenue, and the hotel on Fenton Street. It'll create a more varied and interesting streetscape, but it's also a thoughtful move for the adjacent single-family homes, which will be buffered from the busier street by the apartments, which in turn is buffered by the hotel. Count the vertical lines on the building above, located at Georgia and Wayne avenues. You need visual interest for buildings on the street where people will walk past - and if there's retail inside, you want them to walk as slowly as possible. 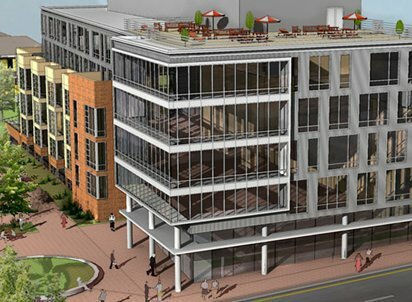 Silver Spring Park's hotel and retail building, meanwhile, is awkwardly proportioned. Urban buildings, even modern ones, look and work better with vertical windows, not horizontal or square ones. The hotel façade looks flat and unadorned - better seen from a car flying down the highway. Around the corner on Silver Spring, the apartment building doesn't meet the ground or the adjacent houses as well as the Moda Vista would have. Setting it back may no longer be feasible with a hotel sharing the property. But the ground floor should be elevated - not only because the building otherwise looks like it's sinking into the ground, but because people walking by now get a full view of first-floor apartments. This is the Montgomery Arms at Colesville and Fenton. 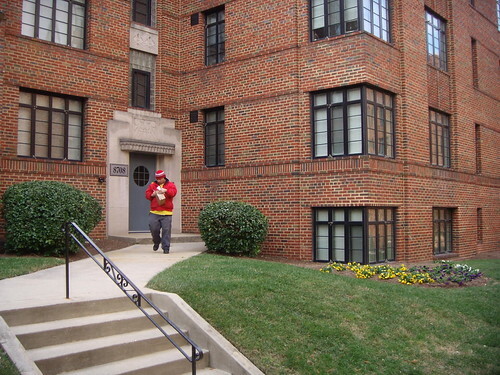 Note how none of the apartments are directly at the sidewalk level - they're either a half-story above or below. No one can look inside without bending down or climbing up. At Silver Spring Park, you only have to look at the houses next door to see how living rooms should meet the sidewalk: either set back or elevated, giving those inside privacy from prying eyes. You might say knocking Silver Spring Park's square windows is a little petty, but I can only criticize them because otherwise it's a great project in a great location. In fact, this is a better proposal than much of what we've seen in Downtown Silver Spring over the past several years. But changes should be made to let this complex blend in better with the urban context. Not only will it be a better neighbor, but it'll give those who sleep, work and shop inside a better experience. Update: Reader Melanie, who attended the meeting last night, suggests that the apartment building may give residents a little more privacy after all. "It might not be clear from the photos, but the apartment building is set back by more than 50' and raised off the sidewalk level, so I don't think you'll be able to peep. Also, the new design is much more succesfull from an urban point of view by meeting the corner rather than creating yet another usless pocket park." Thanks, Melanie! It might not be clear from the photos, but the apartment building is set back by more than 50' and raised off the sidewalk level, so I don't think you'll be able to peep. Also, the new design is much more succesfull from an urban point of view by meeting the corner rather than creating yet another usless pocket park. From an architectural perspective, while the Moda Vista building looks to be more elegant, again I think the new building will be more succesfull in that it will be a nice background building. Glass buildings seem to shine more when they're surrounded by masonry buildings, and alas, we all can't be stars! PS: They where saying next spring for ground breaking. The Montgomery Arms building is really cool-looking. I really love those doors, with the windows that look like the masks on vintage diving helmets (see Tintin books).